The activated anionic ring-opening polymerization of ε-caprolactam initiated by 0.35 mol% of combined initiator, i.e., equimolar mixture of magnesium di(ε-caprolactamate) (CL2Mg) with magnesium halides (MgCl2, MgBr2, and MgI2) as well as of ε-caprolactam magnesium bromide (CLMgBr) in the presence of 0.35 mol% of N-acetyl-ε-caprolactam as an activator has been investigated in the temperature range 140–200 °C. It was found that the reaction rate increased while the apparent activation energy decreased in the following series: CL2Mg/MgCl2 < CL2Mg/MgBr2 ~ CLMgBr < CL2Mg/MgI2. 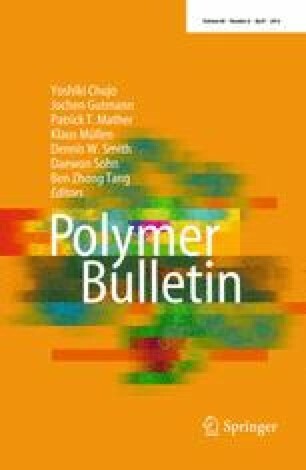 In addition, the poly(ε-caprolactam)s prepared with CL2Mg/MgX2 (MgX2 = MgCl2, MgBr2, and MgI2) are characterized by slightly higher thermal stability than polymers obtained with CLMgBr as initiator. These observations were explained in terms of the coordination of Lewis acids (MgX2, where X = Cl, Br, and I) with imide carbonyl of N-acyllactam end groups leading to the increase of their reactivity and stability. The online version of this article (doi: 10.1007/s00289-011-0621-x) contains supplementary material, which is available to authorized users. We would like to thank the Institut Charles Gerhardt, equipe “IAM” (France) for TGA analyses of polyamide samples.